The Georgia Gun Owners Double Sig Sauer P229 Handgun Raffle is happening now! We’re raffling off TWO Sig Sauer P229 Handguns — ONE .357 and ONE .40 S&W (both valued at $1,229) like the ones pictured below! THERE WILL BE TWO WINNERS — YOU CHOOSE .357 or .40 S&W. Buy at least one raffle ticket and receive EITHER an official GGO Hat or a GGO “Liberty or Death” t-shirt along with a GGO bumper sticker. This raffle ends on October 31. Raffle tickets will be mailed to your address upon purchase. 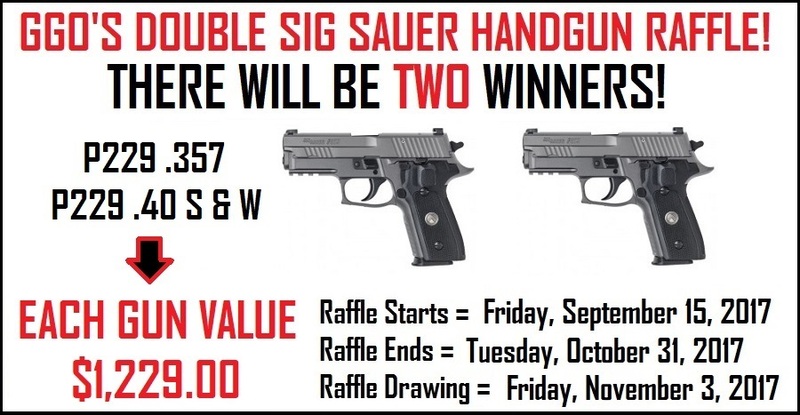 So don’t delay — click here or below and purchase your GGO Double Sig Sauer P229 Handgun Raffle tickets today! Winner will be announced on email and Facebook on Friday, November 3, 2017.